Home Latest Stories Special Stamp on Ice Stupa released. Special Stamp on Ice Stupa released. Stamps are to create awareness about depleting glaciers and affect on the ecology around the Himalayas.Over 12 villages in Ladakh have built ice Stupas this year in various villages. With the technical and material support by the Himalayan Institute of Alternatives Ladakh ( HIAL) , village youths have enthusiasticly participated in building the ice Stupas. To keep motivated, this yesr HIAL has organized a competition among the villages on ice Stupas . Ramon Magsaysay and Rolex award winner Sonam Wangchuk said simple living in cities only would help and allow the ecology of mountains to just survive. Global warming, ecological imbalance have caused irreparable damage oñ Himalayas, thus this awareness through the stamp release has been taken up, he said. 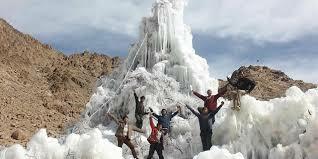 Ice Stupas is not any celebration but survival technique we in SECMOL have developed over a period, Wangchuk said. Saving Winter water, that flows waste, in a cone shaped stupa which is not melted easily is the main idea behind it , he explains.This stupa melts slowly and serves the purpose of drinking and irrigation, he said. In each ice Stupa atleast 30-50 lakh ltrs of water is saved. This is apart from the naturally saved water in the slopes of mountains, Sonam Wangchuk said. Previous article€2 billion to fast forward creation of EIC.